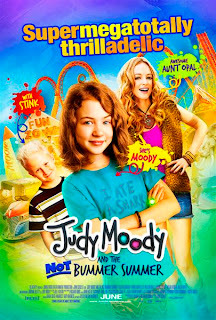 I'm giving away 4 passes to the Philadelphia, PA screening of Judy Moody and the Not Bummer Summer and I'm super excited to attend with my own energetic imaginitive daughter! The actual theater release is Friday, June 10th. 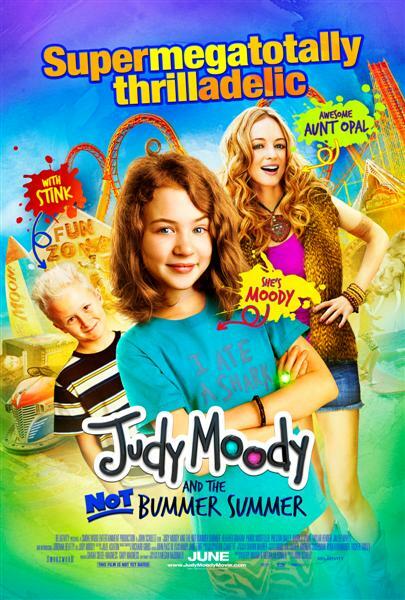 Press Release: When her best-laid plans for a summer full of fun go comically awry, an imaginative young girl creates her own vacation adventures in Judy Moody and the NOT Bummer Summer. Based on the beloved, bestselling book series by Megan McDonald, Judy Moody and the NOT Bummer Summer is an irresistible and delightfully funny treat for adventure-loving kids and adults. This summer, Judy Moody is planning the most super-duper, double-rare summer vacation ever with best friends Rocky and Amy. Except that it turns out Rocky is going to circus camp to learn to tame lions, and Amy is headed off to Borneo with her mom to save a lost tribe while Judy stays home with her pesky little brother Stink and second-best friend Frank Pearl. Just when she thinks things are as rotten as they can be, her parents announce that they will be going to California and Judy will have to stay behind with her Aunt Opal, who she’s never even met! It looks like Judy’s best summer ever has just become her way worst summer ever. But feisty, fearless and ever-funny Judy Moody never gives up! With help from some unexpected sources, she’s headed for a summer full of surprises in this charming and spirited family film. Get ready, get set, get MOODY! *Feel free to tweet this giveaway as much as you'd like for extra entries. Tweet must include @JulieBouf and a link to this post. If you have a non-reply google account or don't have a google account - include some way for me to contact you in your comment (e-mail address, twitter handle, etc...if I don't already know you personally).Please leave a separate comment for each entry type. Contest will end Friday May 20th at 11:59pm. Winner will be chosen via random.org.